You won’t leave The Teatro without feeling a little out of breath after this vivacious show that never misses a beat. Tap Dogs can almost be described as macho ballet, but with tap dancing, six-packs and a urinating gag thrown in for good measure. 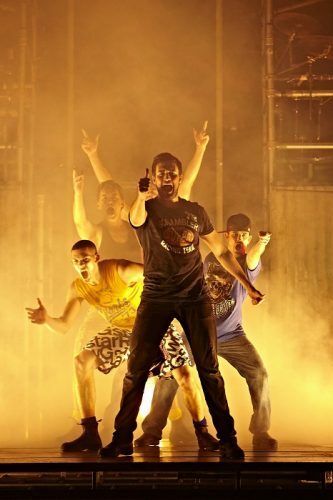 While it sounds like an odd combination, Tap Dogs has established itself as one of those productions that can stand the test of time, thanks to its upbeat approach to tap, its moments of pure spectacle and the way it engages an audience without the need for dialogue. It’s not easy to do, but that’s maybe why Dein Perry’s Tap Dogs has been so successful since 1995. With a shrewd combination of how-do-they-do-that stunts, quick-footed dancing and touches of musical theatre, it’s a show that asks very little from the audience, just sit on the edge of your seat and enjoy. Opening the show is Anthony Russo (Foreman) who with a tap, tap, scratch, tap sets the tone for the high-energy numbers to follow, which includes tapping on ladders, stairs, a basketball, water dancing and a variety of should-be-impossible moments. Five dancers join Russo, each with their own personality meant to be an archetype of the kind of men you’re likely to find working at a construction site. There’s the jokester (Funky played by Chaise Rossiello), the serious one (Rover played by Sam Marks) or the new guy (Kid played by Reid Perry). As the show progresses each show off their moves before the culmination in a giant group number. It’s the group numbers that really show why Tap Dogs have been able to tour the globe, it’s the type of dance you won’t see often. And the audiences respond to it, info with cheers and claps with every new layer of dance during the 75-minute show. If you’ve never seen it, Tap Dogs offers great entertainment. If you did see it during its 2013 South African tour, not much has changed and maybe it would be worth it to save your entertainment budget for really great seats when Matilda The Musical opens later this year. One thing is sure, you won’t leave The Teatro without feeling a little out of breath after this vivacious show that never misses a beat. It’s easy to see how the show has managed to visit 330 cities, 37 countries and blown away 12 million people by its imaginative foot-stomping splendour.